Situated on the Corran Esplanade, Westbay is a grand building with an interesting history. Originally the local sailing club in the 1800’s, a hotel in the 1900’s eventually being converted into apartments in the late 1980’s. 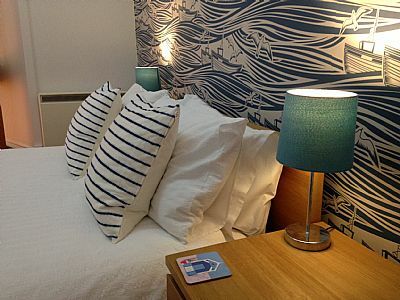 No2 Westbay Apartments has in 2013 been modernised to a very high standard. The large open plan lounge, fully equipped kitchen and dining room is very bright and airy with huge windows looking directly out over Oban Bay and the Islands beyond. The first double bedroom is away from the front of the building so is very quiet and peaceful. The second of the two double bedrooms is accessed through the first and has a large double wardrobe and double bed. The shower room is bright and fully tiled with a spacious electric shower. Westbay has a private numbered parking space for one car and secure door entry system. Outside to the front of the building is a small garden where you can sit and watch the world go by and take in one of the best sun sets in the world.